We all enjoy spending time outdoors. Often much of that time is spent on our decks. Whether grilling, entertaining or just watching the kids play in the back yard the deck is our out door “living room”. Unlike the other living areas of our homes however, the deck is exposed to every extreme of weather nature can throw at it. If you want to protect your investment in your deck and keep it looking good year after year there are some simple steps you should take. One of the best things you can do to protect your deck is to keep it properly sealed. Read the post deck sealant for insight on why sealing your deck is important along with some tips in choosing and applying sealant. A power wash or other cleaning method is usually required on an annual basis. Usually it is a lack of maintenance that causes problems on homes but ironically one of the main reasons for deck deterioration is too much maintenance. With the best of intentions many home owners subject their decks to brutal assaults with a pressure washer ever year. 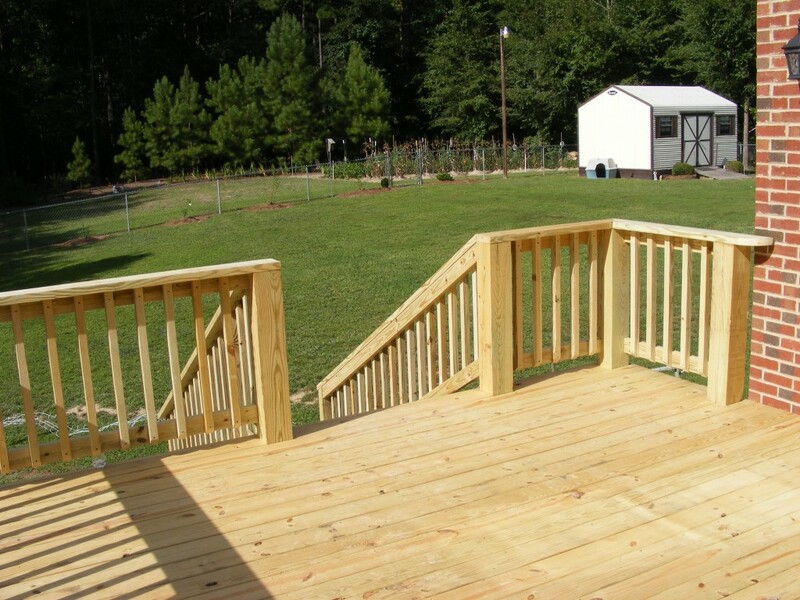 Understanding what your deck is made of and how it was treated will help prevent damage when you power wash your deck. The wood in older decks was treated with Chromated Copper Arsenate. Newer decks are treated with varieties of Alkaline Copper Quat as well as Sodium Borate and Zinc Borate preservatives. The purpose in all wood treatments is to create an environment in and on the wood in which the micro-organisms responsible for wood decay can’t survive. It also makes the wood unpalatable to termites and most other wood consuming insects. Without these preservatives your deck would decay and be devoured by insects just like a log in the forest. Improper use of a pressure washer can contribute to loss of the vital preservatives in treated wood. Pressure washers are all too often used at too high pressure for treated decks and while they wash away the dirt and stains they also blast away the preservatives that are the life blood of a deck. You can however, power wash your deck without diminishing it’s longevity using the methods detailed herein. The right cleaning agents along with some patience will achieve great results without the damage of high pressure cleaning. First wet down the entire deck with clear water from a hose or pressure washer with a low pressure fan nozzle. Then using a pump up sprayer or siphon attachment apply liquid laundry detergent or a commercially available deck cleaner to the entire deck at the rate listed below. Let this work for about 10 to 15 minuets. On areas with heavy stains or mildew apply extra cleaning solution and scrub with a soft bristle brush. Rinse with a hose or pressure washer with a low pressure fan tip never letting the tip get closer than 12” to the deck. Repeat the above process for stubborn stains. Be sure to rinse nearby plants thoroughly. To avoid damaging any plants around your deck wet them down with clear water prior to using any deck cleaners. Rinse any cleaner over-spray off nearby plants while you are waiting for the cleaner to work and after the deck cleaning is completed. Use 1 to 2 cups detergent per gallon of water. If there is mildew add up to 2 cups of bleach along with the detergent. Follow label directions on commercial deck cleaning products. Read all warning labels and use caution when mixing or applying any chemicals. This method will allow you to power wash and clean your deck without washing away the preservatives that protect it. Check out evolution of treated decks for more insights on deck longevity. Read staining decks and deck sealant for tips on keeping you deck looking good longer. Check back for more maintenance tips and visit our website Gallery page to see photos of our work. This entry was posted in Decks and tagged Clean, damaged wood, deck maintenance, deck sealing, deck staining, Decks, Power wash. Bookmark the permalink. This is so informative. Glad I was able to find this article.